Torii Kiyonaga, who was born into a book-seller family, was a pupil of Torii Kiyomitsu (1735-85) and later became the fourth Head of the Torii School of artists. 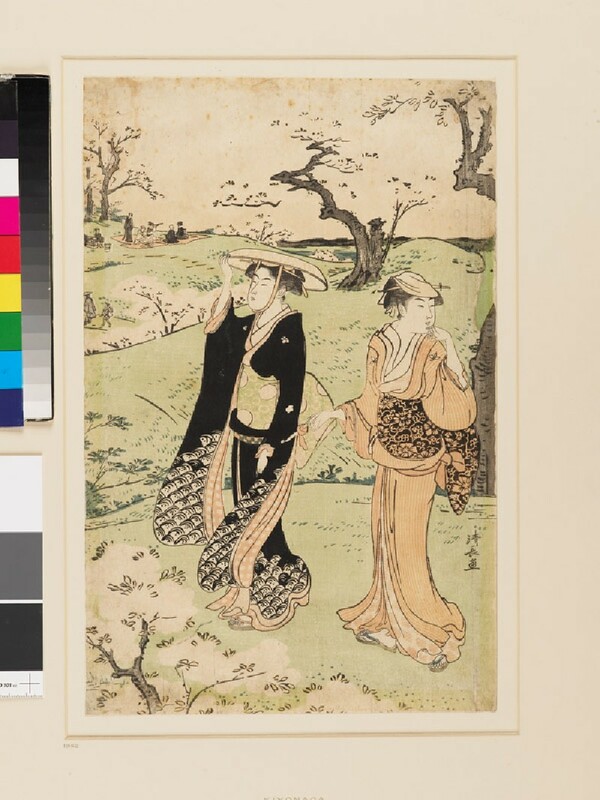 In his earlier works, the influences of Suzuki Harunobu and Isoda Koryūsai can be seen, but Kiyonaga established his own style during the Tenmei era (1781-9). The beauties of this new style were innovatively naturalistic figures with small heads, tall and slender, but the outdoor scenery behind the figures was usually extensive and drawn in geometric perspective. 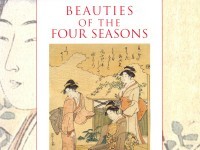 He frequently used multiple sheets of ōban to form a diptych or triptych, thus illustrating whole scenes. This print is a centre sheet of a triptych. It depicts scenery of Mount Asuka, famous even today for its cherry blossom viewing. A lady with a splendid straw hat and a black kimono, and her maid who holds a pipe, are probably having a walk in late spring. In the background, there is a party going on under the cherry tree and a lady holding a telescope can be seen in the distance. The cherry blossoms would originally have been pinker but have slightly faded in this print.